The section of Niagara Falls Boulevard between Main Street and Kenmore Avenue in Buffalo was constructed in 1913 by Constantine Construction Company. Prior to that it was an unsurfaced roadway under the jurisdiction of the City Department of Parks, the 15101 x 401 street was paved with RES-type brick, a hard, impervious paving block slightly larger than an ordinary building brick. All bricks were removed and the whole block was reconstructed in the 1990s by the City reusing the original bricks. 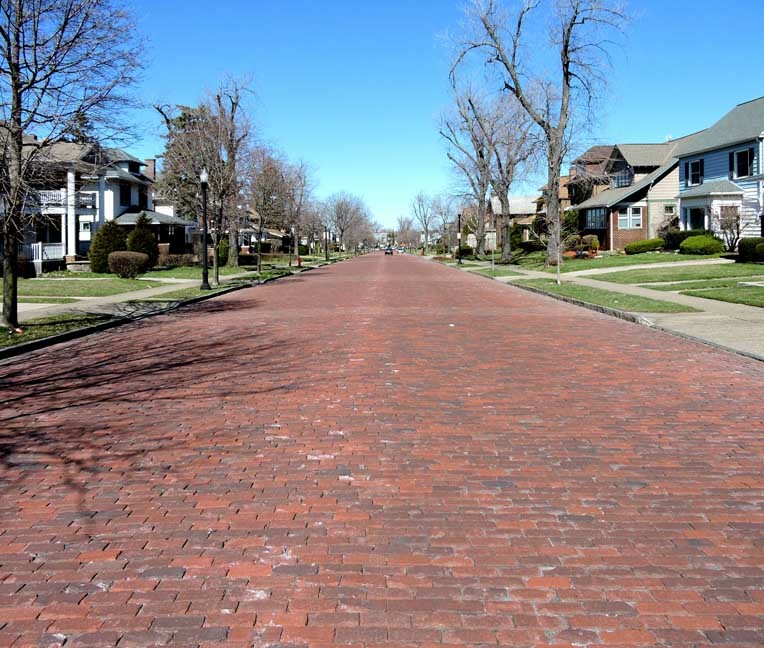 Prior to its paving with bricks, both the Buffalo and suburban portions of the present-day Boulevard were known as Kenilworth Avenue, a name now given to a street a few blocks away in Tonawanda. That street had been constructed on the site of the Kenilworth Race Track, which was destroyed by fire in the early 1900's. Kenilworth was a dirt road which served the race track and extended a few blocks outside the City limits. 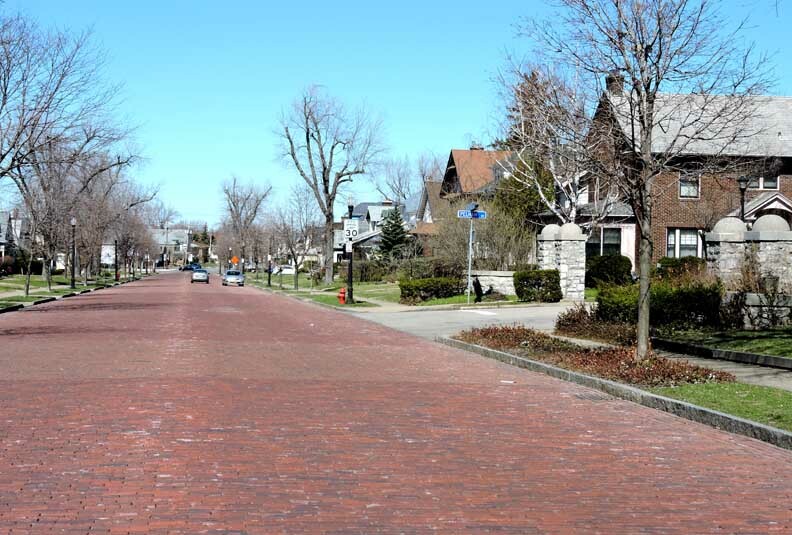 The suburban section of the Boulevard between Kenmore Avenue and Tonawanda Creek was constructed of brick in 1912 and remained a brick road until paved over with concrete in the late 1920's or early 1930's. The construction of the Buffalo section of the Boulevard in 1913 linked Main Street with the previously constructed portion of the Boulevard and coincided with the commencement of classes at the University of Buffalo on the former grounds of the County Hospital and Poor House. No residences existed on the Boulevard before it was paved, but by 1921 approximately 15 of the 50 lots on the block had been developed. A period of rapid growth followed, with most of the residences on the street being built in the 1920's. New construction on the Main Street Campus of the University of Buffalo began in 1920. The University Presbyterian Church at the intersection of Main and the Boulevard first congregated at the site on Easter Sunday, 1921 and by 1928 had dedicated the colonial-styled brick church which now stands on the corner. Photographs taken of the Boulevard in the 1930's show the steady development of the area, including the U.B. campus, and, in addition, show the rapid maturation of the canopy of shade trees over the street. Although the Boulevard was initially intended to carry only "local traffic," not "general traffic" (originally Englewood Avenue was designed to carry through traffic in that area), the Boulevard quickly became a vital link between Buffalo and its northern suburbs and was already being described as "busy" in an account written in 1917. During the early 1940's, the Boulevard was classified as a "primary" traffic route by the War Transport Committee of the Buffalo Council of Defense. By 1954, the street was classified as a truck route. Thus, despite the fact that it was never intended and probably not designed to stand up to the immensely heavy traffic volume and vehicle loads it has borne, the Boulevard has lasted, virtually maintenance free, for 74 years. The purpose of Niagara Falls Boulevard was to allow Buffalo's car owning class an easy way to access the "country" on their weekend drives. It was considered for private purposes, so funding for the Buffalo section came through some sort of special bond. That may be the reason it was not paved over with the rest of it. I have an old ugly picture of it from The Buffalo News, in I believe 1913. In the article it mentions that the Boulevard was paved over in the late 1920s or 1930s. I have not found any specific information on it, but I have clear photograph from the brand new Sheridan Drive in 1925 that shows it crossing Niagara Falls Boulevard and it looks asphalt to me. Aerial photos of the Curtiss Aerodrome at that time seem to confirm it. Interestingly, one photo of that time shows the roads clogged with cars exemplifying how a good number of Buffalonians spent their weekends in that era. I haven't researched Niagara Falls Boulevard past Eggert/Sheridan for that era, but I know as the Kenilworth Racetrack gained popularity they ran another trolley down the now Niagara Falls Boulevard to a trolley station where the ugly optical shop now is on the traffic island. About 1906 I believe. Odd to me that they would lay such on a dirt road. But that road was there before the racetrack. Yes, they certainly liked to change street names back then. Niagara Falls Boulevard must have had twenty different names around the time when it opened. I believe the article [above] is correct in saying that it was called Kenmore Avenue previously, but I believe it was called Town Line Road when the Niagara Falls Boulevard construction took place. Ironically, what is now called Kenmore Avenue was apparently Town Line Road before that. I have seen it, too, as Victoria, but never dug into that. I disagree that Niagara Falls Boulevard was for local traffic. The Towns were seen for just a few things by Buffalo from the late 1800s to the Depression. A place to go for sin, and a weekend drive. They were also seen as the future extension of Buffalo as the Buffalo-Niagara Falls mega-city came to fruition. The conservative Town Of Tonawanda folk were a fan of neither. I truly believe that Niagara Falls Boulevard was laid down as the start of a speculative boom and as a way to realize the vision of the time. There was quite a bit of fanfare about it (though oddly I can't find any pictures of it). Have you heard of Carl H Lind? He was a photographer for the Couier Express but lived in the Town during the era, He donated a massive collection to the old Town Historical Society. When they closed, the local universities and libraries scooped up all the stuff. When I talked to [noted local historian] John Percy he said they tried to get the collection back when the Society reopened, but they refused. John forgets who took them. I know they are not at Buff State nor the Buffalo History Museum. Over 2000 pictures, which most likely include mostly the southern part of the Town, North Buffalo, and Kenmore. They need to be found and shared with all. The area that was the Kenilworth Racetrack can be seen as the Kenilworth neighborhood today. The racetrack was roughly the outlying roads of the double oval neighborhood, but not exactly and shorter on the northern end. 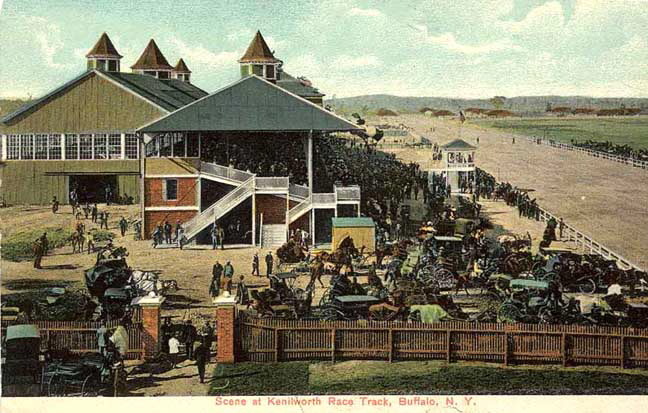 The track closed due to anti-gambling legislation in 1908. The fire was 1914. Between the two dates, one could write a book on all the varied uses it had. There were actually two fires simultaneously. One started most likely by a cigarette thrown from a car on Niagara Falls Boulevard, and the other as a result of practice at the Kenilworth Range which ran from the Voisenet farmhouse, down present day Fairfield, to what is now Lincoln Park. The fire mostly burned the area north of the track where the stables and such were. The grandstand was spared. I can't confirm it, but it seems likely that the grandstand was sold and moved to the Batavia Fairgrounds. Some of the old buildings were moved and used as housing in the Kenilworth neighborhood and still stand. I believe that one house that still stands on Kenmore Avenue was for the main trolley yard, and the first house on Niagara Falls Boulevard was for the race track caretaker.